Last week I bought a portable navigation device (Garmin nüvi250) for my car because I had bonus this month and I did “holiday shopping” like an American. Although many cars in Japan have in-dash HDD car navigation systems costing over 300,000JPY with a receiver for Vehicle Information and Communication System (VICS), they were too expensive for me to afford. Nüvi250 has only a GPS receiver and power cables to be connected to a cigar socket or PC’s USB port, so it’s very cost-effective, costing only 38,500JPY! (about one tenth of the prices of traditional HDD car navi) More than that, it is not only sold within Japan but used worldwide, because Garmin is an American company. Nüvi250 is widely distributed in UK, European countries and the USA (in the USA, nüvi200 is sold instead of 250). This device is simple and does not provide traffic information to avoid jamming routes, but GPS reception accuracy is very good. It displays an accurate position of where you are driving, keeps track of your driving routes, and calculates routes to destination very fast. Road maps are very simple, and easy to see while driving. 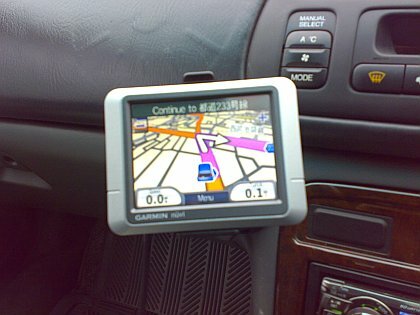 It is very useful for 38,500JPY navigation device, as long as you use it just as a navigator. As it is removable from your car, you can carry it with you anywhere, on the street or on the train, and you can install it to a rental car in a district far from your home town or even in a foreign country, just by plugging the power cable to its cigar socket. When you leave your car, you can put it off the car and in your pocket. There are no risks to be stolen. Navigation is navigation. No functions more than navigation are necessary. PNDs are the most reasonable navigation system of today and more and more devices will be released in a few years, because you have only to pay the reasonable prices for necessary and sufficient capabilities.